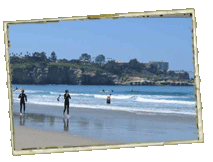 La Jolla Shores is one of the most popular family beaches in San Diego. Located in the heart of sophisticated La Jolla, it boasts a mile-long stretch of sandy shore, a boardwalk, and the only public kayak boat launch within miles. Kellog Park a grassy park adjacent to the beach, provides public restrooms and showers, a children’s playground, picnic benches and the main La Jolla Shores Lifeguard Station. There is also a beachfront parking lot, and plenty of residential parking nearby. The waters of La Jolla Shores are unique because of the recreational activities available in the area. 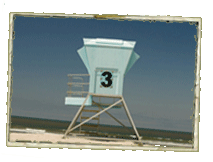 The summer waves are usually the most gentle in all of San Diego, creating a wonderful beach for swimming, wading, beginner surfers, scuba diving, snorkeling and kayaking. To increase safety and enjoyment, the lifeguards divide the shoreline into water activity sections. This is precisely what makes the area so attractive to ocean lovers, as you there are many water activities to choose from. 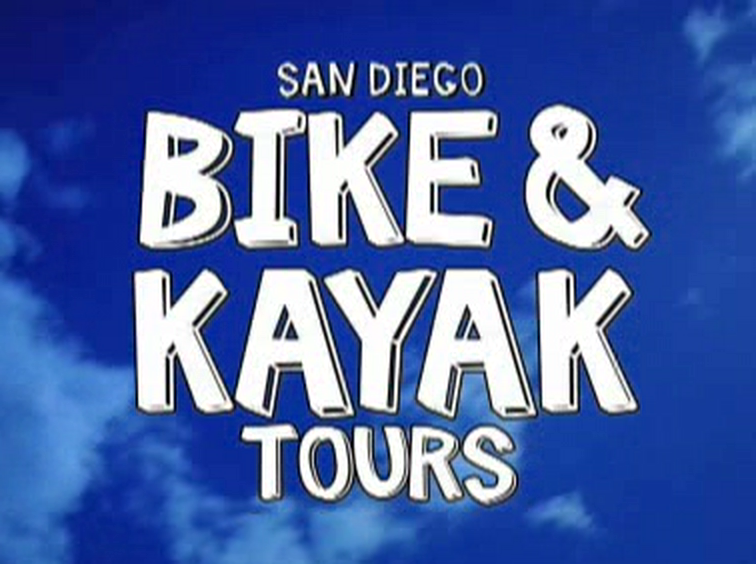 San Diego Bike and Kayak offer a variety of recreational activities, including kayak tours, bike tours and snorkeling tours, as well as rentals of beach gear and bikes. 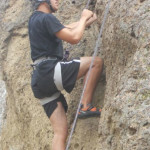 For more information or to book a tour, call (858) 454-1010 or save money online. The south end of the beach is accessible via Avenida de la Playa, and becomes the La Jolla Shores Boat Launch, where we launch our La Jolla kayak tours and La Jolla kayak rentals. This area is an excellent entryway into the unique sandy flats, rock reef, kelp forest and underwater canyon habitats of the La Jolla Ecological Reserve, a 6,000 acre area of underwater land extending off the beach. The Reserve is a “look but don’t touch” area, fostering an abundance of plant and wild life. Kayak fishing and removal of any objects from the Reserve or La Jolla Cove is strictly prohibited, and motorboats, jet skis, etc. are not allowed unless they are traveling under 5 mph. The boundaries of the La Jolla Ecological Reserve are marked by yellow buoys creating a trapezoidal space spanning the La Jolla Shores Beach south to the seven La Jolla Sea Caves we kayak and snorkel along, west to the kelp beds (great for scuba diving), and north to Scripps Pier, a popular surfing area for locals. The La Jolla Shores Boat Launch is the only public beachfront boat launch within city limits. Both private and commercial boaters can use this area to launch their vessels. The boat launch entrance is located at the west end of Avenida de la Playa, on the south end of La Jolla Shores. The La Jolla Beach and Tennis Club borders the boat launch to the south, and the northern boundary is defined by lifeguard placed cones along the sand to the water’s edge. Approximately fifty yards wide, the launch is divided into separate areas for commercial and private activity to maximize safety and efficiency. 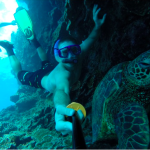 The waters here are designated for boating usage, so swimmers, surfers, boogieboarders, snorkelers, and waders should use extreme caution to avoid entering into this area. Beach users should be cautious as well crossing the beach here, as vehicles are frequently driving on and off the sand unloading their kayaks and other ocean vessels.